About That Holiday Gift for Fido…. Unless you live in a media-free vacuum, you know that retailers have deemed the holiday shopping season is upon us. 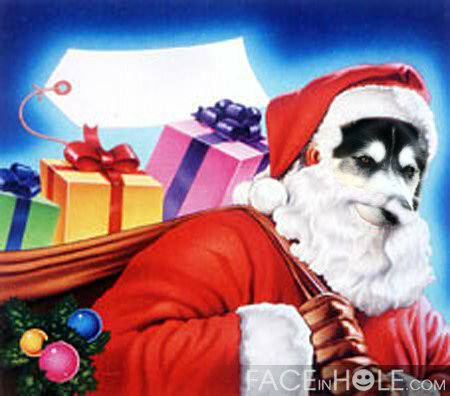 Rumpy Claus delivers cookies to all the good dogs and cats! So let’s talk for a moment about gifts for some very important ones in your life- your animal companions. One of the reasons why the pet product industry is growing so rapidly is that there are few regulations on products sold. Now for you Free Market Economy groupies, you probably see that as a good thing. And yet we can look no further than the jerky treat issue to see how problematic free markets can be. Oh wait, it was less than 4000 animals that got sick in the last 6 years, and fewer than 600 died? Well then, I suppose those are fairly good odds…… unless it was YOUR pet that got sick and/or died. Before you purchase that huge rawhide chew or the cute squeaky toy, and certainly before you give one of those gifts to someone else for their pet, ask yourself what company is selling this product and where it was manufactured. 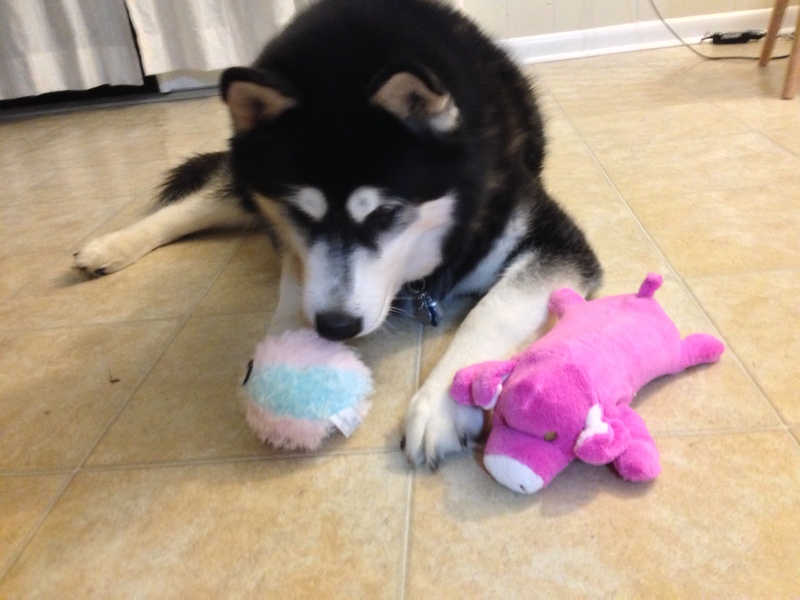 Don’t you want to know where your dog’s toys came from and what they are made of? I suggest you shop with a retailer you trust. Our local boutique, For Pets’ Sake, sells a variety of products for dogs and cats, including high-quality foods and treats, dishes, pet beds, and cute items for humans as well. Jen feels confident shopping there because she can ask questions and get honest answers from the owners and staff. Or how about, instead of buying, you put those baking skills of yours to work and MAKE gifts this year. There are plenty of great recipes for treats for dogs and cats online. Jen’s cookies aren’t pretty, but they sure do taste good! Oh, and speaking of gifts, here is some advice for those of you planning to give a live animal as a holiday gift: DON’T DO IT! Bringing a companion animal into the home requires lots of planning and preparation, and should not be a decision made lightly. An animal should absolutely not be given because your kid begged so loud and so long he or she wore you down. If a new companion animal is in your future, might I suggest you wait until the end of January? That’s when the shelters and rescues will start filling up with all those cute puppies and kittens that kids just “had to have,” then later decided they didn’t need (or want) after all. One gift that fits everyone is a donation in that person’s (or animal’s) name to the animal welfare organization of your choice. It’s always the right size and it looks fantastic! What are your tips for a safe and responsible holiday gift for a beloved companion animal? Good advice. Animals are for life, not just for Christmas. Yes, but not everyone sees them as we do. It’s up to us to help change their perspective. I agree. Unfortunately though that is not so easy to do. No, but it will happen so long as we don’t give up. Hi you have been nominated for the Liebster Award go to http://www.5minutesmoreplease.wordpress.com to find out how to accept the award. We bake doggy Christmas cookies every year and give them to the neighbor dogs, they love it! Rumpy, I hope all peeps will look careful on the packages of the treats and no anipal will get sick from toxictreats. And I hope hope hope all will understand: Animals are a gift – that’s for sure, but not just for christmas. And they are also a responsibility every day of the year. Me too! Should we do letters to Santa again? I’m planning to order a huge batch of those nice enzymatic tooth cleaning chewies. They love them and more, they need them. All they want are more biscuits anyhow, I might as well get them ones that are good for them! *blush* Thank you! woo woo woo!!!!! Very good tips! Especially about adding a new pet. All the holiday commotion can be overwhelming for a new addition too. With 4 cats of all sizes, we don’t do much for the holidays. They get new toys when I find something that I think would work. Not surprisingly, cats prefer toys that don’t cost anything. They don’t play with anything I actually buy. We don’t do treats because we have a tubby one and it wouldn’t be fair to exclude her from a food treat. We do LOTS of ‘nip though. All year long! I cut up an old tee-shirt and make little pockets of catnip. They love those best and will often take one to sleep. One year I included a little bag into the holiday cards of friends with cats. One friend with 3 cats said his mail was shredded by the time he got home and there was catnip all over the floor. Hey, they had a good time! Cats know how to enjoy the simple things in life! They even know how to torment marketers! I make sure to really know the pet who I’m bringing a gift to. Which is a compliment to the pet AND the people he lives with. For instance, I know my brother’s lab loves stuffed animals (small) and never destroys them, but treats them like his own pet. But I know my long-time friend’s boxer is a hard chewer, and only does will with the ‘impossible to destroy’ bone. Fun to take the time to get just the right gift for a dog, as well as for a human friend. Excellent post in all respects!! My stepson’s first dog was a Christmas present many years ago; BUT it was a well-planned, well-thought-out gift…it just so happened that Georgie was born slightly more than 7 weeks before Christmas that year, the breeder was a good, regular customer of Jason’s stepfather, and the breeder held Georgie for them until Christmas Eve morning. (Jason was with us all day while his mom and stepfather went to pick up the pup.) Several years later, we got Callie from the same breeder; and, in fact, Georgie was our Callie’s great uncle…her grandfather was Georgie’s brother/littermate. That generation of Callie’s family is all at the Rainbow Bridge now, but they had good, long lives for Golden Retrievers. I’m hopeful that those healthy genes were passed down to Callie and her generation…So far it appears that they were. I will definitely keep an eye on your blog. I agree with you completely! We go buy all our pet stuff at the local feed store and we ask for advice and they give us our honest opinion and recommended us a great natural dog food and treats with all natural ingredients. And indeed, it is a trend to give a puppy or a kitten as a gift for someone’s birthday or christmas…. but those are impulsive decisions and unfortunately a lot of them end up in shelters. Unless of course the buyer knew ahead of time that the person he’s buying the animal for has been wanting to get a pet for a long time. Whee agree about the food things. Sadly a lot of shops sell yogurt drops or chocolate drops which have dairy in and are just not suitable for guinea pigs despite the way they are advertised. In very, very small amounts they can be ok but some piggies are extremely intolerant and whee have to wonder, is it really worth the risk? However, whee do partly disagree with the pet for Christmas thing. Whee would like to point out that it is only the bad cases, the abandonment, the neglect, the sad cases that are discussed. What about the happy, responsible cases? Mummy’s first piggies, Nibbles and Nugget were her Christmas presents when she was 12, bought two weeks before Christmas so they could settle in and get used to normal noises before Christmas so they weren’t overwhelmed. If you do your research and have been waiting a long time, wearing down your parents, and preparing, a pet is one of the best things you can get. Of course it is heartbreaking seeing those impulse bought animals abandoned, (in fact Buddy and his little friend Bingo were unwanted presents abandoned only three weeks after Christmas, which is just shocking) but you can’t really tar everyone with the same brush if you know what whee mean! Whee cannot wait for the holiday season. The hoomans really love it here! We’re with ya, Rumpy! Especially about not giving a live animal as a present. If you really want to give an animal as a gift, it’s way better to let that person meet and help choose the pet AFTER the holidays. I don’t live in a media free vacuum; its more media seclusionism. Thanks for checking out my blog, I shall say hello to the dog from Rumpydog, its not the same as sniffing bums though ;-). Well said Rumpy..we get toys that are good quality and always please when your dog has finished playing with a toy..check for any loose bits or broken bits and throw out if damaged..we keep all the boys toys in a cotton net bag out of reach..so no swallowed bits when we are not around and the whole bag can be put in a big basin and toys washed…as a family we have for xmas sponsored pen at a shelter..you need to be careful at xmas as people just don’t look closely at the toys or treats. A timely reminder Rumpy. Great idea to mention recipes for treats that can be made at home. 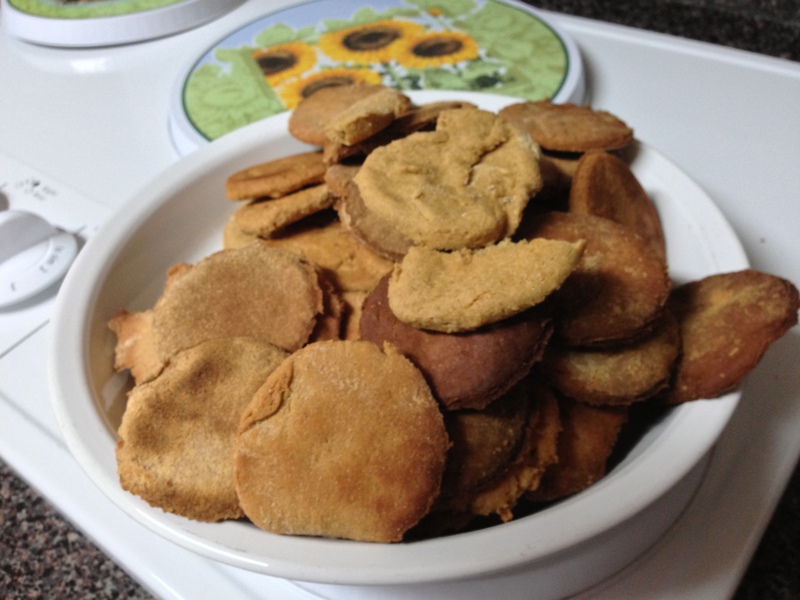 Do your humans have recipes for Georgian doggie treats? At the risk of sounding like the Grinch, we’re somewhat appalled by commercialisation of virtually every holiday imaginable. Safe toys all year round and Jen’s treats too! Your reminder to wait until the end of January is spot on. That is so sad that you cannot be together anymore. Mom said she’ll be careful when she buys my Hanukkah presents. Love the cookies, Rumpy, and your sweet suggestion to donate to an animal welfare organization. Great idea. Happy holidays.